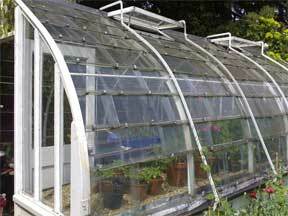 Answer: “Don’t ask me to tell what you can grow in a greenhouse,” says Simon D. Amateur. “With winter licked and climate controlled by a twist of the thermostat the whole world is yours. Read Bailey’s Encyclopedia and take your pick.” The plant varieties are truly endless! I dissuaded him from trying avocados (a 60-foot tree) from seed but must Admit that. I’ve grown numbers of the huge seeds to observe germination and have seen some grow to handsome window plants by careful pinching. A country widow out Nebraska way grows flowers and vegetable plants to augment her income; another greenhouse enthusiast near Chicago has a beautiful miniature landscape with a little fountain for glamour and humidity. Regardless of the way you develop your planting under glass or film, once accustomed to a greenhouse it’s hard to imagine being without it. The limitations of outdoor gardening are gone. Your small hobby greenhouse and cozy workroom are open in any weather the year round. An old-timer suggests “an extra chair by your potting bench for the neighbor who will see your evening light and want to drop in for a chat and the chance to smell the refreshing greenhouse atmosphere.” A TV, radio even cable are also found in the workroom of the deep-dyed fan. Practically any plant you see on your Southern travels can be grown in a DIY greenhouse or from plans, kits and even a lean to, as can the tropical curiosities that delight you in the great city conservatories. You might ask, “Doesn’t a greenhouse have to be very hot to grow tropical plants?” And the answer is “no.” A night temperature of 65° is considered high – too high for many plants. A night temperature of 50° is medium and even 45° will enable you to grow beautiful flowers. You would be surprised to see what a fine show can be kept up merely in a sun-heated pit (we call it solar) covered at night to trap the warmth of the sun, keeping the temperature in the pit above freezing. Here are some favorites that provide many a thrill under the greenhouse glass while the world outside is in the grip of winter. Amaryllis heads the list alphabetically, although some botanists call it hippeastrum. Pot the bulbs in a rich mixture anytime after receipt. Kept warm – but not wet – until growth is active, as many as three flower spikes totaling over a dozen great flat trumpets can be obtained from the choicest bulbs. Colors range from almost purple through pinks to blazing scarlet and purest white. The show from one bulb may last over a month, beginning usually in February. Summer blooms are not unusual. Even the lowliest variety, opening a pair of red trumpets streaked with white or green, can rule the greenhouse or window garden and be the treasure of any gardener. Given an ample pot and rich feeding after flowering and continuously through the summer, the bulbs fatten for the following winter’s bloom. They multiply by offsets so that a family results, and in several years you have enough bulbs for an explosion of bloom. If your original bulb is a choice hybrid, its progeny will then make it a bonanza investment. From A to Z, annuals such as alyssum and zinnias are seeded to brighten the greenhouse. Earth-filled benches may be planted as a miniature garden, or used for cut-flower growing. Alyssum, colorful browallia and lobelia may be used to edge beds or be placed in hanging baskets. Petunias from August-sown seed, or cuttings from the garden’s best doubles, make beautiful pot plants. Many annuals that are commonly grown outdoors produce better flowers in the controlled climate of the greenhouse. Calendulas, for example, become spectacular; and Trachymene (didiscus) caerulea, the blue lace-flower. becomes a feathery thing of beauty. The classical vool-house (45°) annual schizanthus, called by British gardeners the poor man’s orchid, and nemesia produce huge bushes covered with bloom of untold color variation and are well worth the eighteen months of care from seed to bloom. Begonias are of a huge tribe and many species still flourish unnamed in the Andean altitudes. The cultivated classes range from the colorful little wax begonias (Begonia semperflorens hybrids), which can be used outdoors as bedding plants, to the tall “bamboo stemmed” B. Lucerna (Angel wing and silver-spotted types), some of which bear heavy clusters of richly colored flowers. The elaborately tapestried rex hybrids, the pride of many a green-thumbed countrywoman. and all the creeping rhizomatous species, (beefsteak, watermelon, star, etc.) come between, while the phenomenal tuberous hybrids of today must be passed by with a mere mention as primarily grown for outdoor bloom. Spring-flowering bulbs potted and rooted outdoors in early fall may soon be brought inside for forcing into flower. They sing of spring well before the season arrives outdoors. Crocus and Iris reticulata may be placed in the coldest part of the greenhouse, and showy tulips, daffodils and hyacinths do not need a great deal of warmth either. Some rare and beautiful daffodils, incidentally, only flower to perfection in the warm sunshine of a glasshouse. Camellias, rarely winter hardy, colorful outdoor gems of the South. make Northerners so envious that they try them outdoors with some success. However, the greenhouse, if kept just a bit above freezing, enables Northerners to have spectacular flowers from handsome plants. Tubbed and kept outdoors in summer, they are brought inside in late fall. Chrysanthemum growing as practiced by the Japanese was long a mystery in this country, and we were limited to growing long-stemmed, heavy, globe-like kinds. The discovery of the chrysan:- themum’s response to day length triggered a new era of research and development. Today spoons, spiders and other beautiful types are available, some as large and luscious as the old giants but with color blends and forms which outrun an artist’s imagination. Planted outdoors in early summer, many types which normally flower late in the season can be brought into flower outdoors before frost by artificially shading them. In the greenhouse shading is not necessary. Chrysanthemums can be permitted to grow until the day length suits them for flowering. However, often much time can be saved by following a shading program.